2005 was the year everything changed. Doctor Who was back on TV again, and it was going to be a Proper Drama. Christopher Eccleston, one of the most respected TV and film actors in Britain, was playing the Doctor, and Russell T. Davies, writer of such critically-acclaimed work as Queer As Folk and The Second Coming, was going to write the series. The whole thing was going to be fresh, and new, and taken far more seriously. There would be no more wobbly sets or cardboard spaceships, and the fact that those things had never been there in the first place wouldn’t stop the programme-makers telling us so. It would be based in a realistic version of mid-2000s Britain, and would appeal to the same people who liked Buffy The Vampire Slayer. The Doctor was to be ‘brought up-to-date’, by which Davies apparently meant instantly dated to the year of production rather than timeless. The Doctor suddenly spoke in early-twenty-first-century vernacular English, expunged of any vocabulary that would have been unfamiliar to the viewers. He dressed like a middle-aged bloke trying to remain cool, and his companion would be a normal working-class girl from London, not a screamer. Much has been made of how the post-2005 show was aimed at a mainstream audience rather than a ‘cult’ or ‘geek’ audience. This isn’t actually true — apart from the scheduling, which placed the programme firmly in the family slot that it had dominated in the 60s and 70s, everything about this new series was designed to fit almost exactly into the cult series formula. Specifically, it was designed for a post-Babylon 5 audience. It was a series controlled by a single show-runner, who plotted out “story arcs” (we no longer have stories, we have “arcs”, which are like stories but with no story to them — and indeed no arc, usually going straight from A to B in the slowest way possible), and assigned individual episodes to writers, seeding in each episode a clue or clues to the end of the arc, which would coincide with a giant season finale. And within this formula, there was to be nothing that would scare a family audience by suggesting to them that other times or other places were in any way different from Britain in 2005. A space station tens of thousands of years in the future would have reality TV and Top Shop clothing. Social attitudes would be almost unchanged whether in the 19th century, World War II, or at the time billions of years in the future when Earth is finally destroyed. This sounds like I’m being very harsh to the 2005 series, and I am, but that’s mainly in the light of the later excesses of the series. At the time, the 2005 series’ strengths (and there were many of them) more than made up for its weaknesses. 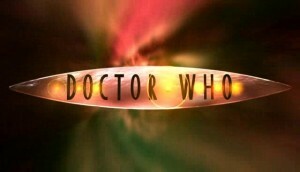 It managed successfully to reintroduce the character of the Doctor and the main concepts of the series in ways that an audience that was unfamiliar with them could instantly understand. 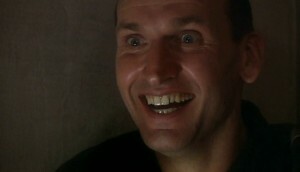 Eccleston, in particular, was a marvel, playing a character that was almost a remix of the original Doctor — every characteristic in his portrayal was an element of the earlier versions of the character, but in different proportions, so that he seemed totally different while still familiar. On reflection, though, almost none of those strengths were down to Russel T. Davies’ writing, despite him being one of the two selling points of the then-new series. Certainly, none of his episodes from this series are thought of especially fondly in retrospect — or even at the time, when compared to those episodes he didn’t write. 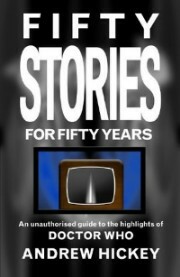 Ask anyone what their favourite episode of the 2005 series was, and they will choose either Father’s Day by Paul Cornell (who has already turned up many times in this series of essays), The Empty Child/The Doctor Dances by Steven Moffat (who we will hear more about in the future), or Dalek by Rob Shearman. Shearman’s episode is, to my mind, far and away the best thing of the 2005 series, and probably of the revived TV series to date. Even so, it’s a shadow of its former self. Because Dalek was originally conceived as a reworking of Shearman’s 2003 Big Finish audio Jubilee, but in the nature of these things the story changed dramatically. What had been the b-plot in the original story (Evelyn befriending a captured Dalek, the last of its kind, alone and tormented) became the main plotline of the TV version, with Rose showing humanity to the last Dalek survivor of the Time War. 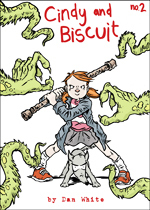 Jubilee had been a sharp, satirical, comedy, with, in Shearman’s usual style, a lot of targets aimed at by allusion and juxtaposition, rather than the more normal straight allegory. Among the targets were the Queen’s golden Jubilee of 2002 (not 2006, Tat…), the way Britain’s fight against the Nazis in World War II has been taken up as propaganda for far-right political groups (the BNP used photos of Spitfires in their election material at the last election), the Dalekmania of the 60s, the way that fandom is backward-looking, prescriptivist grammarians, and basically the whole right-wing idea of a past Golden Age. 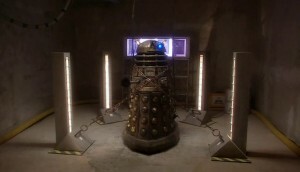 Most of this is stripped out of Dalek, along with the time-travel paradox plot which had driven Jubilee, and replaced with a far simpler linear plot, based around the central image that Davies wanted to keep from the audio story — the Doctor angrily confronting a lone, powerless, captive Dalek. Apparently the result of many, many rewrites, the finished script is a wonderfully-done variant on the old base-under-siege theme (this time, of course, the monster is inside, a la Alien). The script has flaws, of course — the pseudo-scientific explanation about “time traveller DNA” makes absolutely no sense on any level, and the Doctor’s line “What you gonna do, throw your A-levels at him?” is horrifically misjudged for a character who up to that point had been one who valued learning for its own sake — but it’s a tight, well-made thriller, and the central performances (not only Eccleston and Billie Piper, but also Nicholas Briggs as the Dalek voice) perfectly pitched. But it’s sad that so much nuance and subtlety had to be lost in the transferrance from audio to TV. And it’s even sadder that even after losing that much nuance and subtlety, what remains is still a more intelligent, better-written, script than anything that’s been done in the TV series since. What I want to know is why Rob Shearman has been given a chance to writeanother story? 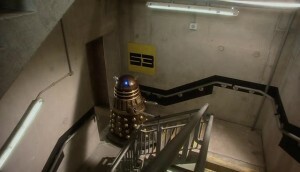 Dalek was a cracker and as you say probably the best episode in the new series. And that’s even with the schmaltzy ending which is now de rigeur in Nu Who. I have a complicated relationship with NuWho. On the one hand, I recognize that the show is by-and-large inferior, at least in terms of writing, to both the old series (or at least, some of the old series), and certainly much of the spin-off material (most of which I am still unfamiliar with). I still remember the day back in 2005 when I sat down to watch the new DOCTOR WHO that was running on the Sci-Fi Channel. I didn’t have high hopes: if you can recall, there wasn’t too much hype on this side of the pond when the series premiered. It took a while to make it over to America, and when it did, it didn’t seem like a lot of people were talking about. So I set a record timer on my DVR, thinking, what the hell, we’ll give it a shot. I expected it to be terrible, based on – well, everything. But even though the writing for this first series was often poor – with a few standout episodes, true – I was still, against my better judgment, caught up. I guess, not knowing much in advance, I had just assumed it was going to be a stem-to-stern reboot a la BATTLESTAR GALACTICA. But as soon as I started watching the series, it was clear that this wasn’t a total reboot – this was the Doctor, in a new incarnation. The first time we see him he’s flicking his ears and looking at his new face. So even though “Rose” was, in many respects, pretty bad, somehow my atavistic reptilian nerd brain knew that this was The Doctor, the same one that I grew up with and remembered watching on PBS late weekend nights with my parents when I was knee high to a grasshopper. And then when we got to “Dalek” – well, not having been exposed to the superior early version of the radio play, I was blown away. Despite its problems it hit all the nostalgia notes necessary to hook me once again, for good. So I’ve been on the ride since then, basically accepting the implicit bargain that in exchange for mostly awful stories we get to see good-to-great performances from appealing actors. I mean, don’t get me wrong, there *have* been some good stories – and a couple of the arcs were pretty good as well. (I still love the build-up to the big reveal in Season 3, for instance, even if they botched the dismount something awful in “The Last of the Time Lords.”) Even if I didn’t care for a lot of Tennant’s performance, he was still a game performer, and the last arc that ran through the specials and “The End of Time” did a good job of redeeming his unlikeable nature for me. So I watch, even when the poor scripts make me fume, because it’s still the Doctor. And it’s nice to have the Doctor around. Tangent: Tennant appeared in a trail for his RTD-written rompcom CASANOVA at the end of the first episode of DW2005. I watched it for the first time last night, and while I thoroughly enjoyed it (sledgehammer modern references aside), Tennant’s performance is so Who it’s basically a big advert for Series Two. I think the shows that NuWho laid the groundwork for – and I mean for better or worse, everything from Primeval to Robin Hood to Being Human to Orphan Black (that accent!) – make all the Noughties clunkynes worthwhile. I don’t think they could have jumped into something like Inferno (which starts as The Doctor versus Fracking, gets weirder) in 2005. Dalek is boss, though. And we’re a year beyond it now! My personal feelings about NuWho – like those of many ‘Classic Series’ fans- remain mixed: at heart, I don’t find much to get unduly excited about it in it, but a certain sense of collegiate obligation keeps me returning to the programme. With this said, I recognise that this is a very subjective opinion: I personally miss, for instance, qualities of the classic programme that could in no way be emulated in 21st century TV – the detailed exposition, the slowness of story unfolding (broken down into 25 minutes chunks over a lengthy run) the triumph of bold concept over sometimes limited design etc. There’s no sense in mourning the loss, because production values move on, and Who has always stayed ahead of the game by altering its format at periodic intervals in order to stay relevant to its current audience. When those who had last avidly watched Who in 1989 (1996 was clearly a false start) sat down to reignite their fascination with the show in 2005, 16 years had passed, and that is a long time in terms of television production. There was always going to be a disjuncture. Yet, it seems to me, the essence of how NuWho *works* lies in the very awkwardness of its inheritance; during those 16 years, the only individuals who had remotely cared about Doctor Who at all were the dyed-in-the-wool fans (and even they were perhaps beginning to lose their enthusiasm by the early 21st century). Suddenly, Davies is hoping to score a mainstream success, and persuade a new audience demographic that Who is the future – but must simultaneously do everything he can to retain the support of the traditional fan base as he does so. After all, to begin with, the only guaranteed loyalty he can rely upon is that of the fans who would, after all, see the arrival of new Who as the culminating event following 16 years spent in the wilderness. Having prayed this long for the return, they’d now accordingly tune in in droves. But, at the same time, the worst possible principle RTD can adopt upon which to structure his series is to offer any recognition to the immensely convoluted (and contradictory) canon that has emerged across all media during the hiatus period. It is now so dense that an ordinary member of the public cannot be burdened with it, or they’ll sink under the weight. What, then. is his solution? It’s to continue, on the one hand, to appeal to the fans by crafting a vision for the programme that is reminiscent of other cult material of the early Noughties, to employ fan favourite writers to contribute to the scripting, and to tacitly acknowledge the importance of the hiatus era. Yet, it’s simultaneously part of Davies’ job to rebuild Who from the bottom up, as if he’s rebooting the whole franchise, so he’s also busy constructing a new mythology, keeping the plotting simplified and easily accessible to teatime viewers, introducing new monsters and so on. One of the obvious reasons that old school fans have gradually become more alienated from NuWho is that, as the hold of the new mythology has strengthened, and a new generation of fans has arisen for whom the key concepts of Who revolve around fezzes, and River Song, and Weeping Angels, and Slitheen, and Amy Pond, and Torchwood, there is no longer as strong a need to recognise that there was once an importance accorded to Earth Reptiles, and Cloister Bells, and UNIT, and the Cyber Wars, and Time Rams, and Rassilon. Lip service is paid, for certain, but while I don’t know why a talent like Rob Shearman was not asked back to write post 2005, it’s obvious that an adaptation of his Big Finish audio was seen as much more necessary in 2005, then it would be seen as today. I have no idea whether, when you choose an episode for 2006, you’d consider ‘School Reunion’, which is not, perhaps, the most significant point in that season – but it is certainly interesting as the definitive moment when the new television series categorically eschews the claims of fandom to ‘own’ the series. Appeal to fans and appeal to the mainstream was still being finely balanced in 2005, but as early as the next year, once can gain a sense that RTD was ready to flex his muscles. Whether this was a good or bad thing is moot: it was what happened. The Doctor has been told that an alien has been captured and is imprisoned in this wealthy man’s dungeon, and then he is thrown in as well. The room is dark. The Doctor’s compassion dominates any fear he may have, and he resolves to save this creature when he inevitably escapes. 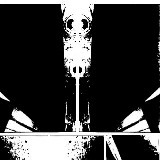 He calls into the gloom, assuring the poor alien that he knows it has suffered, but he is going to set things right. He’s called the Doctor. And from the darkness…the two ear-like, dimly strobing lights flash as it rasps out, “The…DOC-TORRRRRR??? ?” in that voice that has scared little children since 1963. It’s a DALEK, and we weren’t sure if we’d even see one in the new series because they’d all been destroyed, and all the chatter was about how this Doctor Who was going to be new and different and not using the old monsters. The Doctor has been thrown into a locked room, weaponless, with his deadliest enemy. …which would have been infinitely more effective if they HADN’T CALLED THE EPISODE “DALEK”! Why look at the response to Neil Gaiman’s second outing to see how quickly fans round on their heroes. Or as Bob puts it: having nailed the new series “Genesis”, why come back and risk providing the new series “Timelash”. Or indeed “Fear Her”. More generally, I do think 2005 pushes the envelope a lot further than is generally given credit for. It’s certainly more ambitious than the subsequent series where the writing starts to get cozy (or complacent if you want to be unkind). There’s some biting satire in there which the series drops quite soon. “Aliens of London” is at heart about a conspiracy to fake a war in order to secure a fuel source. It’s a rubbish looky-likey but that is supposed to be Tony Blair who they kill and leave in a cupboard. And there’s the Massive Weapons of Destruction/45 seconds line to really ram it home. 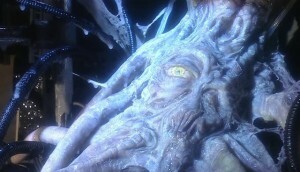 But it’s remembered for farting aliens, poor match between costume/CGI and perhaps the Pig In Space. “The Long Game” is a long rail against passively accepting the news; it directly tells us – how relevant to this week’s Daily Mail shame – how manipulating language manipulates the human empire. But it’s got Adam in it, Simon Pegg goes over the top and the monster is rubbish, so it’s universally reviled. Even Moffat’s soft-focus nostalgia-fest is about a teenage singly-mum and the damage that forcing people into nuclear family boxes can wreak. Above all it’s about consequences. Eccelston’s Doctor is suffering for the consequences of the Time War. (Or the Gulf War) He very clearly has PTSD. And a Death Wish (look how he throws himself in the way of harm again and again). 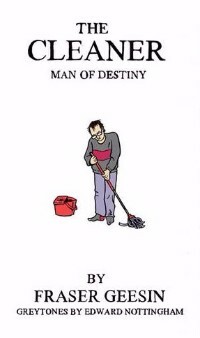 But when he f***s up – by his habit of wandering off when he thinks the adventure is finished – it comes back to bite him. That’s why “Boom Town” isn’t just the cheep filler episode; it’s the whole point of the season. He didn’t finish off “Aliens of London” properly; he just went swanning off. Someone had to point out to him that he can’t just do that and expect it to be fine every time, and so Margaret Slitheen does that… and *then* the Daleks can come back to really hammer the point home. But then the whole “Bad Wolf” meme got out of hand and people lost the real plot arc under the “mystery” of who or what the Bad Wolf was. Michael – I don’t think we can single out the new series for the title complaint. Loads of the old series’ Dalek stories had the big cliffhanger reveal – of the monster we knew was coming from the title. Tom Baker was similarly anti-intellectual at the start of The Ribos Operation, but he got his comeuppance straight away. It doesn’t really explain the inconsistency in the character, but at least Holmes showed that he was wrong. And once that had happened it set a precedent in the ‘canon’.